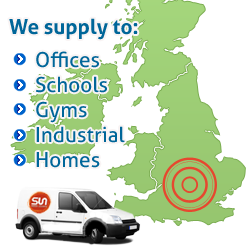 We are based in Oxfordshire, ideally located to our customers to provide a reliable local service. With a range of Drinking Water Dispensers, to include Bottled-Fed Water Coolers, Mains-Fed Water Coolers, Hot Water Boilers, Filter Taps and Mini Coffee Machines. Our Water is a high quality, well known brand "Blenheim Palace Natural Mineral Water", which is sourced and bottled in Oxfordshire, supplied in 18.9 Litre and 13.0 Litre bottles. Along with Drinking Cups, Beverages and In Cup Drinks, we offer a complete Service for Hot & Cold Drinking Water Supplies. We supply Mains Coolers, connected to your mains water supply, fitted with high quality filters. touch of a button, along with the Beverage drinks for the machine.